The NFL, its clubs, players and the NFL Players Association are proud to support the fight against breast cancer. Our campaign, “A Crucial Catch”, in partnership with the American Cancer Society, is focused on the importance of annual screenings, especially for women who are 40 and older. Throughout October, NFL games will feature players, coaches and referees wearing pink game apparel, on-field pink ribbon stencils, special game balls and pink coins – all to help raise awareness for this important campaign. All apparel worn at games by players and coaches, along with special game balls and pink coins will be auctioned off at NFL Auction, with proceeds benefiting the American Cancer Society’s Community Health Advocates National Grants for Empowerment (CHANGE) program. 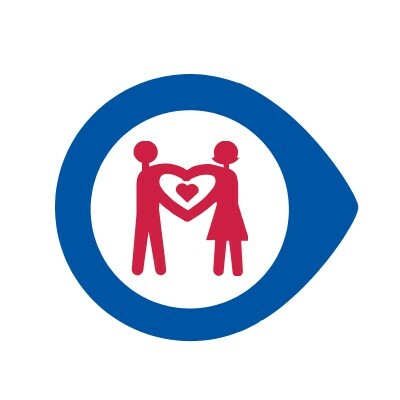 The American Cancer Society’s Community Health Advocates implementing Nationwide Grants for Empowerment and Equity (CHANGE) Grant Program builds community and system capacity to promote health equity, access and navigation to screening resources within underserved communities. 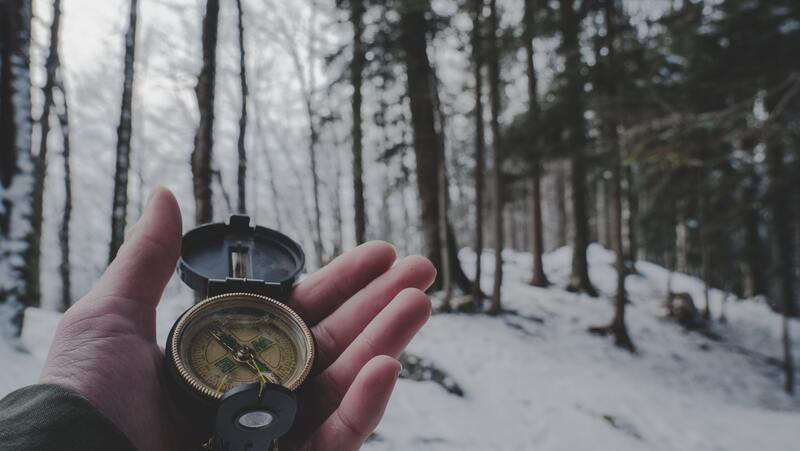 CHANGE grants serve as a catalyst for partners to implement and sustain interventions to effectively engage and mobilize patients; and implement systems and policies that are essential to increasing access to timely cancer screenings. The Society has awarded nearly 350 grants since 2011 and grant recipients are making amazing impact! Our grant recipients represent community health centers, community-based organizations, academic medical centers, breast and cervical cancer early detection programs, Indian Health Service health centers and faith-based organizations. Learn more about how these CHANGE grants are impacting communities here. 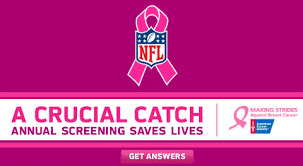 New in 2017 the NFL and the American Cancer Society have expanded the Crucial Catch program to include early detection and risk reduction efforts for other cancers to increase the impact of the campaign. Read the full press release here. As part of the campaign, the NFL and ACS launched a new, digital tool, The Defender, which provides the public with free personalized tips to reduce their cancer risk. In the spirit of ‘The Best Defense is a Good Offense,’ people can enter information about their height, weight, exercise regimen and more. The tool will analyze and provides personalized recommendations on what they can do to reduce their risk of getting cancer. The Defender was funded by the NFL and developed by ACS and can be found at TheDefender.cancer.org. You can take part in the Crucial Catch initiative by bidding on authentic game-worn NFL Crucial Catch products, to learn more or place your bid visit the NFL Crucial Catch page here. Schools and leagues are also invited to join the fight as part of the Crucial Catch with the Coaches vs. Cancer program. To sign up or learn more, visit here. This entry was posted in american cancer society, mission, second life and tagged #acs, #American Cancer Society, #breast cancer awareness, #cancer, #Crucial Catch, #NFL, #TEAMMSABCofSecondLife, #The Defender, 2017 MSABC in SL, ACS, american cancer society, awareness, breast cancer awareness month, Making Strides Against Breast Cancer, making strides against breast cancer across second life, mission, MSABC, Ways to Help Wednesday on October 25, 2017 by sandieloxingly. The biggest key to fighting breast cancer is early diagnosis. 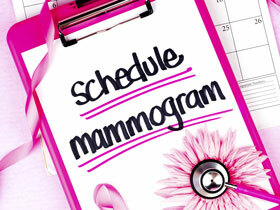 Along with your monthly self-exam, most women should schedule an annual mammogram. Breast cancers found during screening exams are more likely to be smaller and still confined to the breast. The size of a breast cancer and how far it has spread are some of the most important factors in predicting the prognosis of a woman with this disease. Women 55 and older can switch to a mammogram every other year, or they can choose to continue yearly mammograms. Screening should continue as long as a woman is in good health and is expected to live 10 more years or longer. Once you have had your mammogram, what happens next? Usually following a mammogram you will get a letter with your results within 30 days that everything was normal. But if doctors find something suspicious, they’ll call you back – usually within just 5 days – to take new pictures or get other tests. Getting that call can be scary, but a suspicious finding does not mean you have cancer. A suspicious finding may be just dense breast tissue, a cyst, or even a tumor that isn’t cancer. Other times, the image just isn’t clear and needs to be retaken. Or, if this is your first mammogram, your doctor may want to look at an area more closely simply because there is no previous mammogram to compare it with. You will likely have another follow-up mammogram, a diagnostic mammogram. You may also have an ultrasound of your breast or possibly an MRI. * The suspicious area turned out to be nothing to worry about and you can return to your regular mammogram schedule. * The area is probably nothing to worry about, but you should have your next mammogram sooner than normal – usually in 4 to 6 months – to make sure it doesn’t change over time. * Cancer was not ruled out and a biopsy is needed to tell for sure. – Even if you need a breast biopsy, it still doesn’t mean you have cancer. Most biopsy results are not cancer, but a biopsy is the only way to find out. During the procedure, a small amount of tissue is removed and looked at under a microscope. * Make a list of questions to ask at the appointment. Download a list from the American Cancer Society or call us at 1-800-227-2345. * Bring a family member or friend with you. They can serve as an extra pair of ears, help you remember things later, and give you support. * Ask if you can record important conversations. * Take notes. If someone uses a word you don’t know, ask them to spell it and explain it. * Ask the doctors or nurses to explain anything you don’t understand. How can I stay calm while waiting? * It’s normal to have these feelings. * Most breast changes are not cancer and are not life-threatening. * Talking with a loved one or a counselor about your feelings may help. * Talking with other women who have been through a breast biopsy may help. * The American Cancer Society is available at 1-800-227-2345 around the clock to answer your questions and provide support. 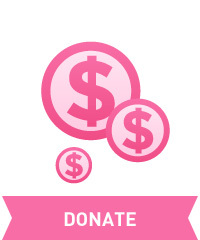 For more on mammograms and the importance of early detection, visit Cancer.org here. 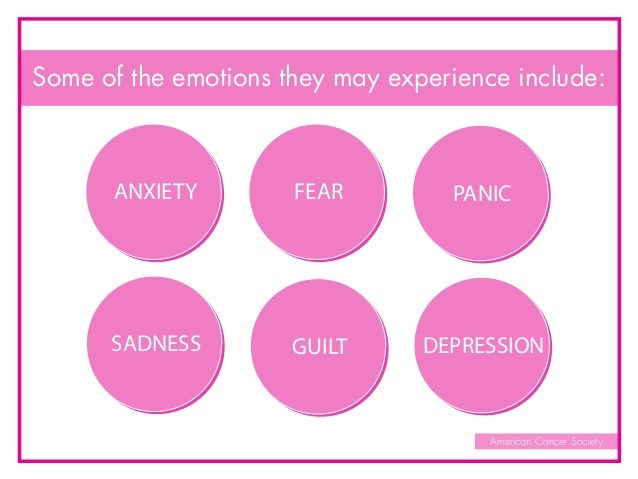 Learn more about non-cancerous breast conditions here. Guidelines for what to do if you are called back after a mammogram, visit here. This entry was posted in american cancer society, making strides, mission, second life and tagged #acs, #American Cancer Society, #breast cancer awareness, #cancer, #Mission Monday, #TEAMMSABCofSecondLife, 2017 MSABC in SL, ACS, american cancer society, awareness, breast cancer awareness month, Making Strides Against Breast Cancer, making strides against breast cancer across second life, Mammogram, mission, MSABC, Treasure the Chests on October 23, 2017 by sandieloxingly. As we near the end of this year’s MSABC campaign, We are pleased to inform you that another step has been made toward our end goal! 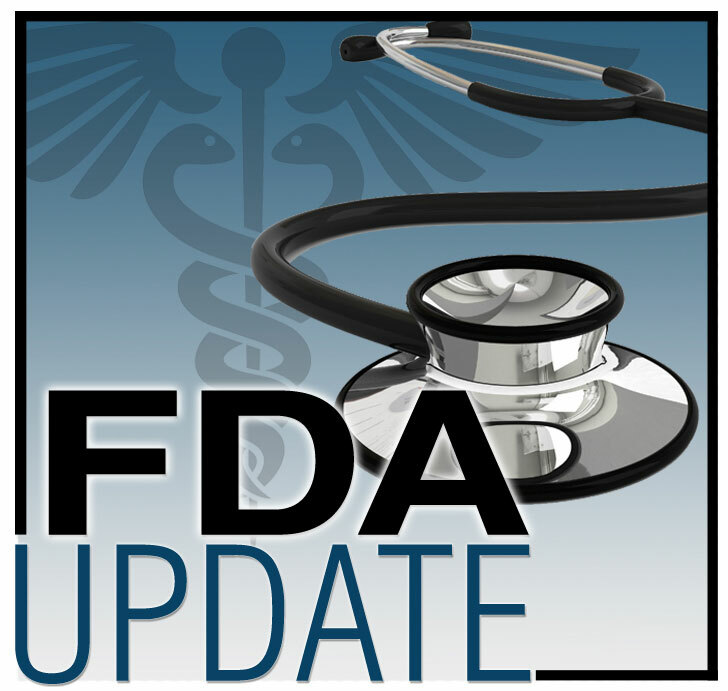 On September 17, 2017 it was released that the FDA had approved Verzenio (Abemaciclib) for the treatment of certain advanced breast cancers. To learn more about Verzenio (Abemaciclib) and what types of advanced cancers it can be used for, please see the official release here. This is why we continue to Make Strides with your support! This entry was posted in american cancer society, making strides, mission, second life and tagged #acs, #American Cancer Society, #breast cancer awareness, #cancer, #TEAMMSABCofSecondLife, 2017 MSABC in SL, ACS, american cancer society, awareness, breast cancer awareness month, Fact Friday, Making Strides Against Breast Cancer, making strides against breast cancer across second life, mission, MSABC on October 20, 2017 by sandieloxingly.